AN ORDINANCE AMENDING ORDINANCE NO. 2-1990, ORDINANCE NO. 3-2000, ORDINANCE 9-2004, AND ORDINANCE NO. 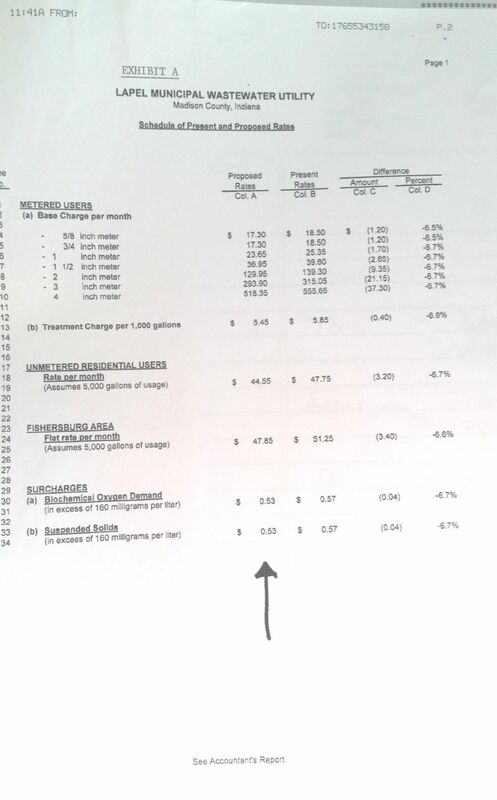 10-2005, OF THE TOWN COUNCIL OF THE TOWN OF LAPEL, INDIANA, ESTABLISHING A REVISED SCHEDULE OF RATES AND CHARGES FOR THE USE OF AND SERVICES RENDERED BY THE SEWAGE WORKS SYSTEM OF THE TOWN AND OTHER MATTERS ASSOCIATED HEREWITH. WHEREAS, the Town Council of the Town of Lapel now determines that proper notice has been given as required by Indiana Code 36-9-23-26 and that a public hearing on the proposed revised schedule of rates and charges was held on the 18th day of December, 2008, in the Town of Lapel, Madison County, Indiana. That the Prior Ordinances, are hereby amended to reflect the rate for all included users as specifically set forth in Exhibit A, Column A, entitled "Proposed Rates". Further that those proposed rates are now ordained, adopted, and approved by the Town Board of Lapel. The revised rates and charges provided in this Ordinance shall go into effect in the April 1, 2009 billing period and after the adoption of this Ordinance. The Ordinance shall remain in full force and effect from and after its passage and adoption. Except as hereby amended and revised, the Prior Ordinances shall remain in full force and effect. Passed and Adopted by the Town Council of the Town of Lapel, this 15th day of January 2009.